Perfect Tart Crust: buttery, just a little sweet, and tender as can be. This easy-to-make, basic dough will complement any kind of filling! Fall is in full swing now, my friend! Soon we will be knee-deep in pies and tarts! I figured, why not get ahead of it, and post one of the most useful recipes in any good baker’s arsenal: Tart Crust! 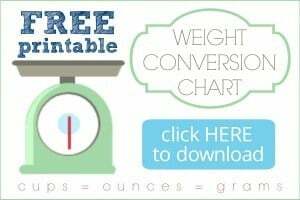 I’ve been using this recipe for years, and it’s even a component of many of the recipes you’ll find on this website. Check out this Salted Honey Nut Tart, these Lemon Cheesecake Tarts, and this Rhubarb Tart, and you’ll see what I mean! Tarts are fun to make, mainly because they’re so versatile. 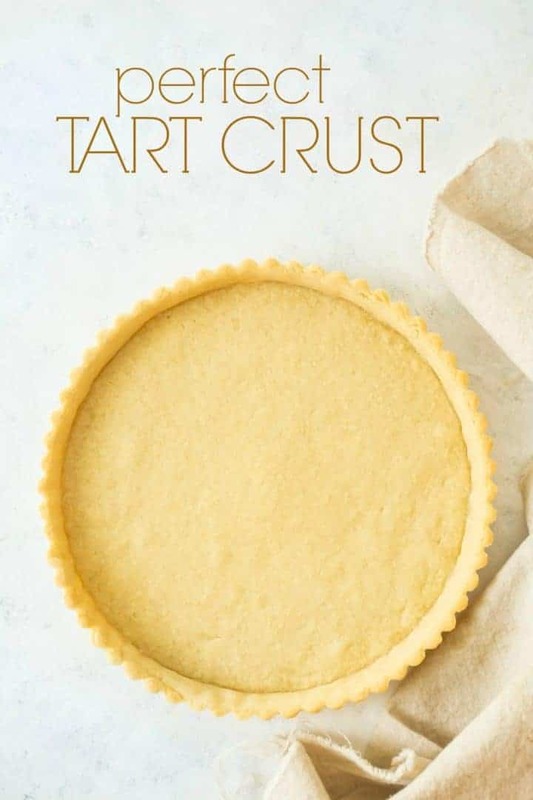 You can fill a tart crust in so many delicious ways! But the pastry dough is step one. You want a recipe that’s easy to make, tender and a little crunchy, buttery, and not too sweet, to provide the perfect contrast. And this recipe is IT! 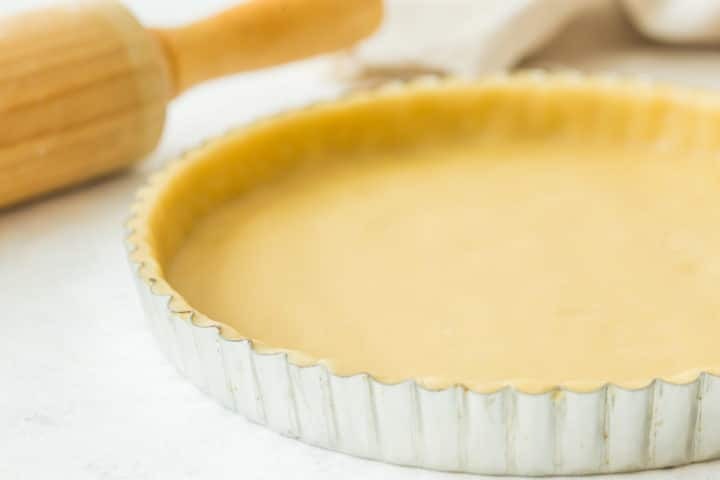 When you make a tart, the crust can be almost as important as the filling! You want to make sure that you have a sturdy base that provides a flavor contrast as well as a little bit of texture. Tart crust is definitely it’s own kind of thing. It is buttery and a little sweet, and it has kind of a shortbread-like mouthfeel. It’s not the same thing as pie crust. Pie crust, while also buttery and not too sweet, tends to have more of a flaky texture, while tart crust is more like a cookie. And honestly, tart crust is WAY easier to make! This dough comes together in about 10 minutes flat. You gotta love that! 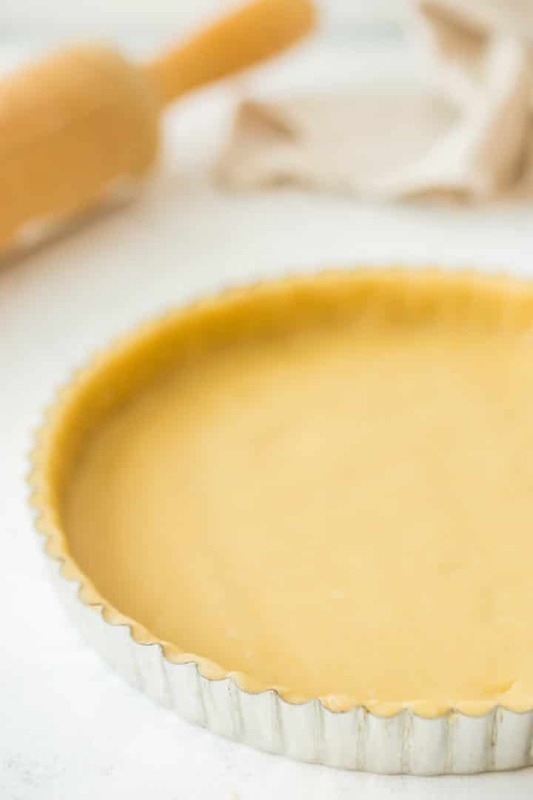 I like to make this tart crust recipe in the food processor, but if you don’t have one, that’s totally fine! It can also be made in a stand mixer or the old-fashioned way, by hand! Start by combining the dry ingredients: flour, powdered sugar, and salt. Just give them a quick stir. Next, add the butter. It’s best if the butter is cold. If you’re using a food processor, just pulse it a few times until you have something that resembles coarse meal. This can also be done with a stand mixer fitted with a paddle attachment, or by hand with 2 knives (or one of my favorite tools: the pastry blender). Once the butter is cut in to the dry ingredients, you can add the liquids. An egg yolk provides richness and structure, a little cream will help keep the dough workable, and vanilla extract is added for flavor. As soon as the dough has gathered itself into a ball, stop mixing. If the dough is overworked, the tart crust could come out tough and it could also shrink a lot as it bakes. Wrap it tightly in plastic wrap, and chill for about an hour in the fridge, just to stiffen it up a little and make it easier to roll out. 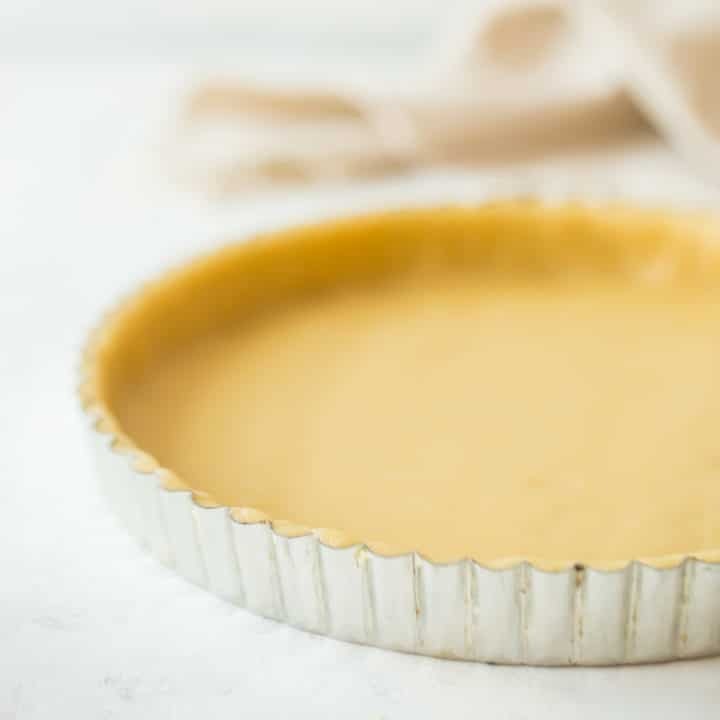 WHAT SIZE PAN CAN THIS TART CRUST RECIPE BE BAKED IN? Honestly, you can use this recipe for just about any size tart (within reason!). For the pictures and video you see here, I used a standard-sized 9-inch round tart pan with a removable bottom. But it will also work with an 8-inch round pan, a rectangular tart pan, or even with a set of 6 mini tarts. Just roll the dough out to just an inch or two wider than the diameter of your cake pan. This is typically about 1/8-inch thick, but if it’s a little thicker or thinner that’s totally ok.
HOW LONG SHOULD THE TART CRUST BAKE? Really, it depends. If you have a tart recipe, follow it. Sometimes tarts are baked filled, and sometimes just the pastry shell is baked, without the filling (this is known as “blind baking). Just to give you an idea, the blind-baked tart shell you see here was baked for 20 minutes at 375 degrees F.
If you’re blind baking your crust, you might want to prick the bottom with the tines of a fork. This will prevent it from getting air trapped underneath and poofing up as it bakes. Sometimes it’s a good idea to place dry beans or pie weights in too, for the same reason. I didn’t do either of these things for what you see in these pics, and it was totally fine, but if you’re finding this to be a problem for you, give these solutions a try! CAN THIS TART CRUST RECIPE BE MADE AHEAD? I would recommend making the dough about an hour ahead. If you chill it much longer than that, it might become a little too stiff to work with easily. Of course, this can be remedied just by leaving it out at room temperature until it becomes a little softer. You can also pre-bake the shell (unfilled), if your tart recipe allows for that. It will keep in a zip-top bag for a few days at room temperature, about a week in the fridge, and around a month or two in the freezer. When you’re ready to assemble your tart, just thaw the pre-baked crust at room temperature, and fill! 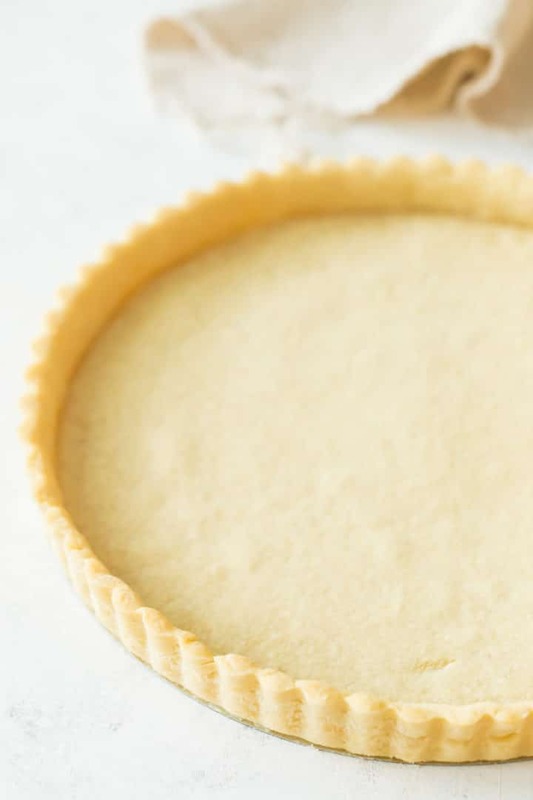 Next time you’ve got the itch to make a beautiful tart, try this perfect tart crust recipe! It’s the perfect base to complement just about any kind of filling! Place the flour, sugar, and salt in the bowl of a food processor, stand mixer, or in a medium mixing bowl. Pulse/stir/cut in the butter with a pastry blender, until the mixture resembles coarse meal. Add the egg yolk, cream, and vanilla, and process/mix/stir until the dough gathers itself into a ball and pulls away cleanly from the sides of the bowl. Wrap the dough tightly in plastic wrap, and chill for 1 hour. On a lightly floured surface, roll the dough to a thickness of about 1/8-inch. Press the dough gently into the tart pan(s), trimming away any excess. That looks amazing! My tart crusts always seem to melt away in the oven if I don’t use pie weights (and even a little bit when I do 🙁 ). Definitely going to try this recipe soon! That’s interesting Merel! Hopefully this recipe brings you better luck with your tarts! The baking master strikes again! What a perfect tart crust. Oooh a good tart crust recipe is so important to have! Thanks for sharing. What temperature do you needto cook this tart crust? Hi Erica! Please check out the info listed under the heading “How Long Should the Tart Crust Bake.” Thanks! I’ve been researching for some fun ideas for a dessert for a Christmas party and happened on this tart crust. I tested it out tonight and it was fantastic! My husband was skeptical, thinking he wouldn’t really like it, but he raved about how good it was. I ended up making mini pastries using a cupcake tin, filled them with a mascarpone cream filling, and topped with a few berries, and they were great! Thanks for a wonderful recipe! That’s fantastic Rebekah! I’m so happy you and your husband liked it- sounds like he is a tough customer! Love your idea about how to fill the crust. Sound delicious and so pretty! This dough came together beautifully for me. The texture in hand was so amazing. I did stray from the directions slightly. Instead of making a dough disk to chill. I rolled my dough out after mixing in food processor, between two pieces of parchment paper to the size diameter of my 9 inch tart pan, then I let the dough chill in the refrigerator for an hour. After the hour was up, I took my dough out to let it come to room temperature While my oven is preheating to cook my tart crust. Once it came to room temperature Already in the size diameter I needed for my tart pan, I fitted the dough still cool to the touch into the pan, oven reached its 375 degree Fahrenheit temperature and I wrapped the edges in tinfoil and put it in the Oven as soon as possible while the tart dough is still very chilled to the touch but not exactly room temperature soft either. My reason for trying it this way…. is to prevent the dough from shrinking in my tart pan as it bakes. Here’s to hoping that method works. So glad to hear the dough came together well for you Emmi! That chilling method sounds like a great idea! This is a near perfect crust. I thank you so much, easy to make, even easier to eat. So happy you liked it! Thank you for the positive review! Can I substitute the heavy cream with whole milk? Hey Liz! You’ll get the best result if you bake the recipe as written. I want to try your recipe, the results look great. If I leave out the sugar; could this be used for savoury pies? Hey Susan! If you’re looking to make a savory pie, I think you’d really like the pie crust recipe linked a few times above. This one is meant for tarts which are generally sweeter.